Scientists are portrayed as dispassionate, objective, and following where the evidence leads. Not hardly! They're people living in a sinful, fallen world just like the rest of us. Unfortunately, those making money in the science industry have some serious problems that stem from their materialistic worldviews and the philosophies of the age — and their political positions are on the hard left. My tax dollars at work! What follows will link you to four articles, so I hope you come back to finish reading this post. Many of these scientists, as portrayed by their obsequious media, are the arbiters of truth. After all, they're scientists, and have the necessary tools. Their elitism shows in their blatant hatred of President Donald Trump, who has only been in office for a few days, but these yahoos have him all figured out and condemned. But that's the left, they do that. The leftist science industry is also very interested in education (especially evolution and global climate change), you bet your boots. They're scientists, they have the truth, and everyone else (especially Conservatives) are ideologues. But they have to convince (actually, manipulate) people with propaganda, and browbeat people they consider to be enemies. This is similar to the attitudes of people who oppose Question Evolution Day: ridicule, mockery, claiming to believe in freedom of speech as long as it meets with their approval, and so on. Typical leftists. Typical anti-creationists. From there, they move on to a secularist jihad to fight back against the truth. Or, as they believe, against error because they have the truth. Of course, there is no reason to consider any evidence against their presuppositions and the "science" presented through poor research and circular reasoning. Here's the first link, "Big Science Blind to Its Bias". 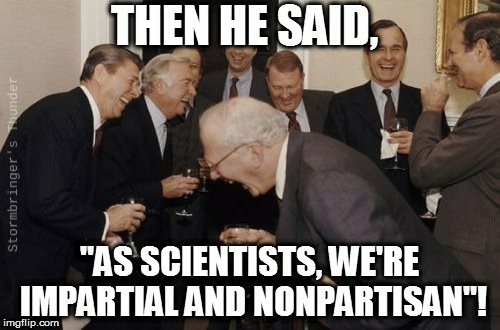 Now we get more involved with the political aspect of the secular science industry. They have assumed Trump is evil, as are Republicans. (I expect bias and bigotry from atheopath stalkers on the Web, but such ridiculous thinking from people who are trained and paid to think rationally is beyond the pale.) One reason to hate Trump and Pence is that they are not sheeple who follow the global warming consensus or lichen-to-leftist evolution viewpoint. They think "science" is threatened, which is based on their leftist views and on fallaciously conflating science with consensus. There is also the claim that Trump is pushing scientists to political activism. That dog won't hunt, old son. People are responsible for their own actions — at least, in the real world. The secular science industry and their feckless media are overwhelmingly materialistic, rejecting God the Creator and any evidence contrary to evolution and global warming. An aspect of their philosophy is scientism, a self-refuting view that truth comes from science. Some tinhorns go so far as to equivocate science with reason. (Then they call us "anti-science" when we have the temerity to show the flaws in their worldview.) But science can only go just so far. In fact, it is a method of interpreting observed data, and those interpretations are based on the worldview of the scientist (or anyone else, really). Now I'll give you the final link, "Big Science Blind to Its Scientism". What we see is consistent: leftists are blinded to the truth, oppose the truth, despise any who disagree with them, and prop themselves up at the noble elite. But they are blind fools. All of this should not be all that surprising to those of us who know the Bible. Still, it's disappointing to see people who are supposed to be (and claim to be) objective acting like angry children. At least furious leftist scientists are not smashing windows at Starbucks or burning cars. Yet.